This stone cross is situated in the churchyard at St. Giles, adjacent to the garden of remembrance. But this was not its original location. This was in a hexagonal burial area set into the woodland leading down from St. Giles toward Shire Lane. The woodlands were at that time owned by the Lubbock family. The Lubbock family burial ground was initiated in 1916 when Alice Lubbock decided to create a more elaborate memorial to her husband John. She had his body exhumed and transferred to a consecrated plot in family owned woodlands about 100 yards from St Giles churchyard. Between then and 1980, a number of family members were buried there, although not everyone who has their name on a monument is actually interred on the site (for example Harold and Eric are buried in British war cemeteries near where they were killed). From the 1930s no new graves were created. Instead, deceased family members were buried within existing tombs – most often under the Celtic cross which was John Lubbock’s grave. 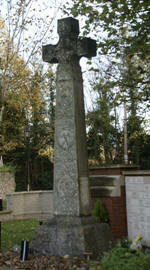 Their presence was marked by inscription on the sides and base of the cross. These can still be viewed today. The shape of the burial ground was hexagonal. Surrounding it was a chain link fence with 12 white wooden posts. At the north and south end were two wrought iron gates. A path led to the graveyard from the field just south of St Giles and another led from it going down towards the gatehouse lodge in Shire Lane. By the 1960s the cemetery had become a place of peaceful contemplation. The ground was grassed over and well-kept. At one side there was a small bench where one could sit looking inwards. In 1986, or thereabouts, Bromley Council decided to move some of the memorials into St Giles churchyard. It is understood that they were concerned that they were hard to maintain and keep from vandalism where they stood. 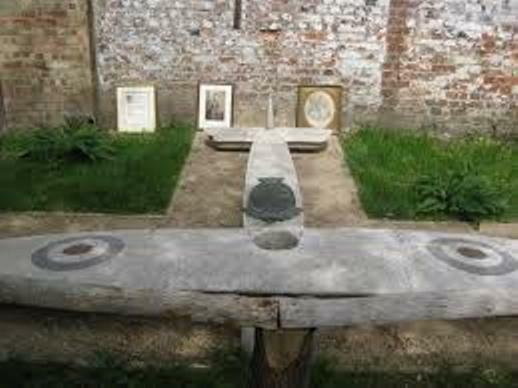 There were six monuments in the burial ground, including one in the shape of an aeroplane. Graves 2, 3 and 6 were moved into St Giles churchyard. Bromley Council sold off 5 (the aeroplane monument) to a stone mason’s yard in Great Bedwyn, Wiltshire. The base remains of 1 and 4 are still on the site although the blocks have been broken up. The process by which this transfer took place is rather opaque – obscured by history one might say. Bromley claim to have lost all correspondence relating to the matter and no one in the Lubbock family had any knowledge that it was happening at the time. What has emerged since (in 2014) is that the Lubbock family still own the cemetery, a fact that at the time was not known to them. The London Borough of Bromley have since tidied up the site. They have converted one of the graves into a rectangular railed off spot marking the approximate centre of the cemetery. There were moves to create some more elaborate markers together with more detailed signage but these were eventually shelved – presumably for lack of funds. Eric Reginald Lubbock, the 4th Baron Avebury, and former MP for Orpington, died the morning of 14th February 2016 of a type of blood cancer. Eric was buried in the family graveyard at High Elms in a small private ceremony on the 21st of February. This was conducted with Buddhist rites and chanting monks, which drew a few curious glances from walkers passing through. Some of you will have noticed that work on restoring the plot has begun and eventually we hope to install a headstone when the soil settles. Two benches have been put in for passers-by and we hope to have some explanatory signage put in shortly. Several Lubbock gravestones can be seen today in the St Giles graveyard, including the tall Celtic stone cross taken from the family burial ground in the 1980s. During that period Eric’s uncle’s grave (in the form of a stone aeroplane) was disposed of and my father spent many years trying to find it. Eventually in 2010 it turned up and your current incumbent, Matthew Hughes, helped us re-dedicate it when we had it placed back in High Elms. At the time the family were worried that it might be unsafe in the family graveyard so it was placed in the Beeche centre within the walls of the former kitchen garden of the big house. Last year the family casualties (Eric Fox Pitt Lubbock, Harold Lubbock and Adrian Grant Duff) in WW1 were added to the list of the fallen read out at the Church’s remembrance ceremony which my wife Sue & I attended. This was a very moving occasion and it was a salutary lesson to see how long the list of personal losses amounted to. . Recently we have become closer to St Giles and I would like to think we are now friends of the Church. Matthew and your parish clerk, Liz Diamond have both been very helpful to us during the arrangements for Eric’s funeral and everything consequently went very smoothly on the day.